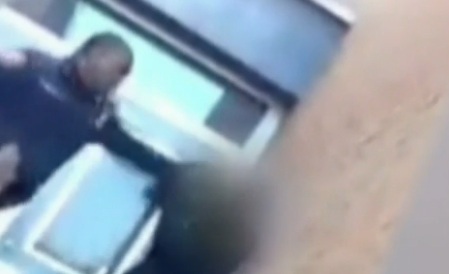 BALTIMORE -- The head of the Baltimore school police force and two officers are on administrative leave after video surfaced showing an officer repeatedly slapping a young man at a school, CBS station WJZ-TV reports. Slap after slap-even a kick-was caught on camera as the officer uses profanity while striking his victim at Reach Partnership School, a middle-school/high-school. WJZ-TV reports that the chief of Baltimore City school police, Marshall Goodwin, has been placed on administrative leave because of the incident. The recording came to attention of authorities after it was sent to CBS Baltimore. "I was totally appalled at what I saw today," said Karl Perry, chief officer of school supports. School leaders told WJZ-TV that the police officer in the video will not be back at school Wednesday. He has been reassigned until the investigation is complete. "I am a parent and I am totally appalled by what I saw in that video. No matter what the circumstances are, I am totally appalled," said Perry. Reach Partnership is one of seven high schools in the city that has a school police officer dedicated to the building, which is large, according to school officials. It's not clear what led up to the very first slap or what happened after the camera stopped rolling. "If it was my son, I would be highly upset, asking questions, want to know what happen prior to it, but nobody deserves to get their hands put on them like that," said Gary Payne. The school system could not confirm whether the young man getting slapped is a student, but the student who recorded the video told WJZ-TV that the victim does attend the school. Baltimore City schools also did not identify the school police officer, according to the station. "He's lucky that wasn't my little brother because I would be in jail right now. He had no right doing that," said David Lucas.